Wrapping gifts? See our tips to make it beautiful & meaningful! Hello Friends!! So the lovely ladies of No Place Like Home asked me to participate in a holiday wrapping roundup. To be entirely honest, my first reaction was, “Are you kidding me?” (sorry ladies). You see…here is the deal. I love to decorate for the holidays but I never really enjoyed wrapping gifts and am certainly no pro. I am guilty of decorating earlier and earlier every year. The rule of thumb used to be the day after Thanksgiving. That was until several years ago when we moved across the country from family. Most years our family comes to visit us for Thanksgiving and we celebrate Thanksgiving and Christmas all at the same time. 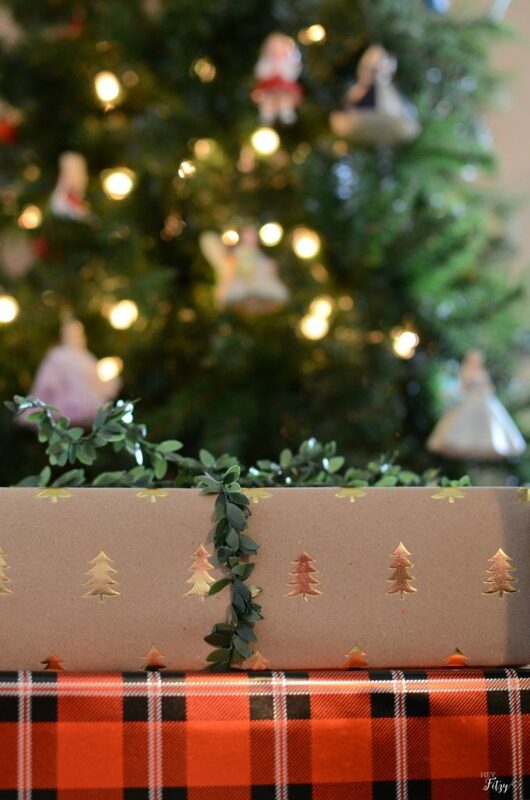 Instead of shipping gifts back and forth, this works for us. I like to have the house all decorated before family arrives. The great benefit to decorating early is that I get to enjoy my holiday decor even longer. I spend the entire month of December listening to Christmas music, baking, and basking in the glow of holiday lights. I adore this part of the season. The part I enjoy the least is all the presents. A present for this person…a present for that person. The list seems to grow year after year and to be honest, this causes me stress. We have really tried to cut back on all the gift giving to really focus on the true meaning of the season. Is any one saying ‘ba humbug” yet? Sorry folks! When I do buy a gift, I want it to be special. Not just another gift that my kids will lose interest in next week. Not just another gift that will sit in a corner unused collecting dust. When our gift giving list was much longer, I was lucky if I could even get the gifts wrapped in time. Up half the night slapping paper on some and throwing the other gifts in gift bags. Sound familiar. 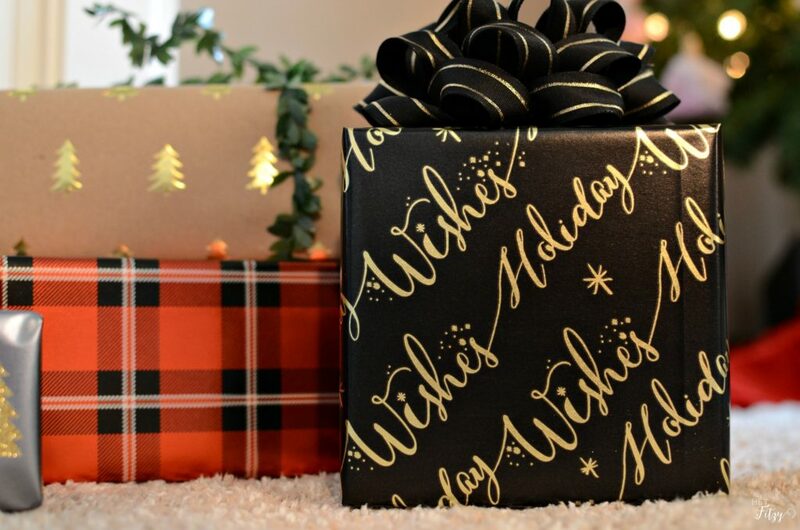 Now that my gift list is more manageable, I like to take the time to individually wrap each gift and spend a little extra time on the details. Nothing ever really fancy or over the top. I mean lets be honest, my kids will have it ripped apart in record time. But I do love the thought of a beautiful package. Pick a color theme- This year I went with blacks, gold, and red plaid. I just love the way the presents look under the tree when they coordinate. Start with a good box- Sometimes the prepackaged item is flimsy or a weird shape. A good box is the bones you need for a good start. Include a bow or ribbon- This has the same impact as curtains in a room. Gives it a more finished or polished look. I like to invest in quality bows and reuse them year after year. My kids know to save the bow on Christmas morning! Add something unexpected- This might be a little sprig of greenery from the wreath or an extra little ornament. Something fun to add extra visual interest. Create a cute name tag- You can use fun little stickers or make tags out of paper. Right now I love the idea of using alphabet stickers or little alphabet stamps. 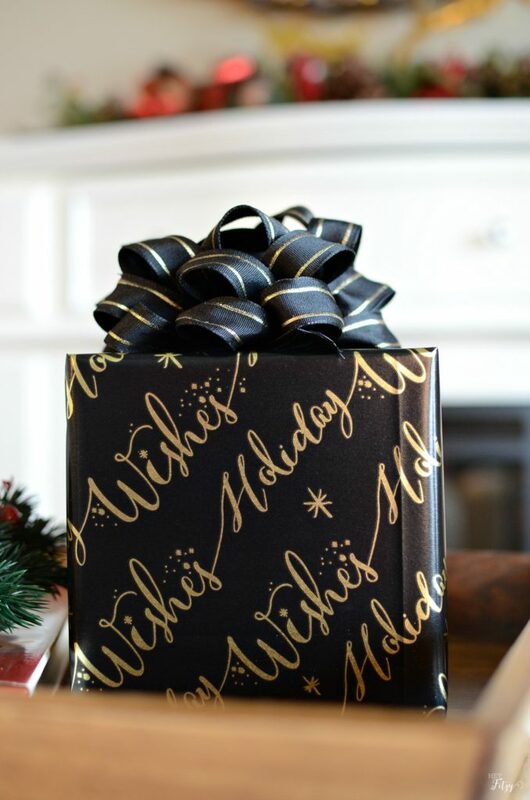 What is your favorite way to wrap holiday gifts? Click on the blog names below to visit the lovely ladies of No Place Like Home. Everyone is all wrapped up for the holiday!!! 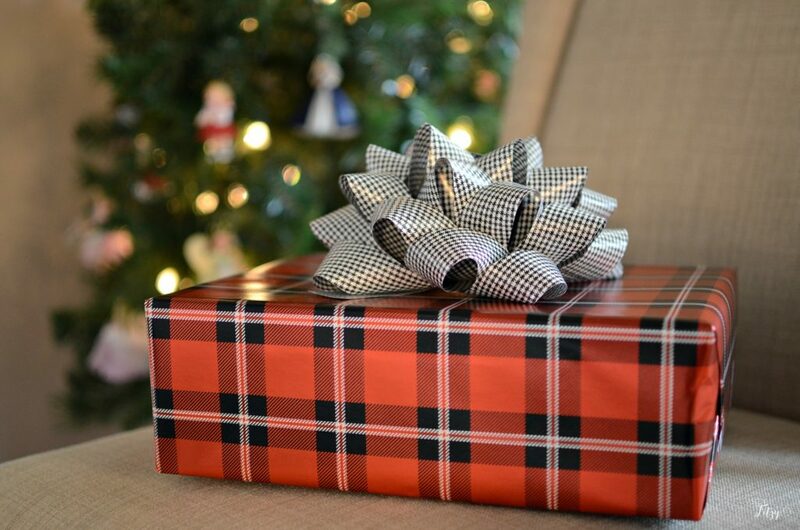 I love your gift wrapping colors that you picked! I love when the wrapping paper coordinates. Great tips! I especially agree with #2. 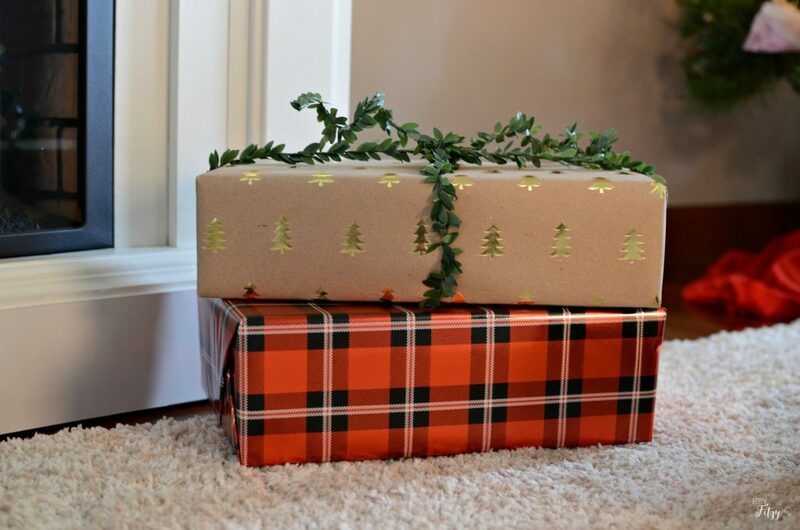 The box make a huge difference in how the present looks and it will make the job so much easier if you have god boxes around. You definitely seem like a pro to me! Hi Robin, Certainly no pro. :) But as you mention, starting with a good box makes all the difference!!! I would agree Lynn!! With this beautiful roundup each of us should have the best looking presents ever!! Great tips Tammy! I usually throw odd shaped items into a gift bag. I need to make an effort to get some good quality boxes this year for those items! Hi Nicki, My kids peak so I can never use gift bags. :) I have a bin full of boxes and bows that I use over and over each year. My kids know to save the box and bow each time. Hi Kimi, I can't tell you how many years we spent the same way. Up half the night wrapping all the gifts. Now we try to do it all ahead of time so we can relax in that moment! I have even gone so far as to set a temporary due date when I would be done with shopping and have everything wrapped. That has been the most helpful! Tammy, I have saved bows from the time we married. I had one huge box I carefully put them into. I no longer have any of those, but I still have a fairly large box I keep bows in. I love coordinating papers and ribbons, too. You gave some really great tips! Hi Carol, I don't mind investing the extra time and money into the wrapping of each gift especially when I know the bows and pretty extras will be used again!! Hi Melissa, Thank you for your kind words!! After way too many stressful holiday seasons, I have learned I enjoy the holidays even more when I am not overwhelmed by a long to-do list. 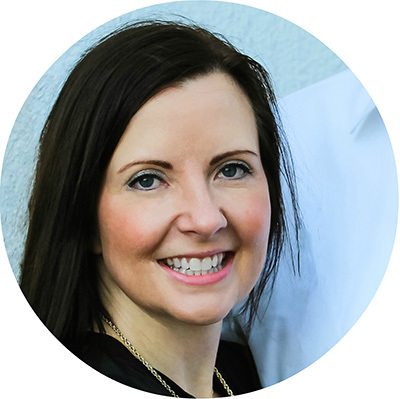 Getting things done early was a game changer for me. These are really beautiful. I have to admit that I'm not very creative when it comes to wrapping. I've just defaulted to gift bags and called it a day. These are inspiring though. Very cute ideas on here. I love wrapping Christmas presents. My favorite part is decorating the presents. I feel like it changes the whole look of the tree too! Hi Carmen, You are so right! The look of beautiful gifts really change the look of the tree! Your packages look lovely! I actually love to wrap and make each present look special. One of the secrets for great looking bows is using wired ribbon. They always look great! Thanks for sharing your ideas! Hi Pam, I would agree! Wire ribbon is the trick to making great bows! I am really starting to enjoy the wrapping process more and more! Thank you Emily! Wrapping for the holidays is so much fun! Thank you for hosting a great party!